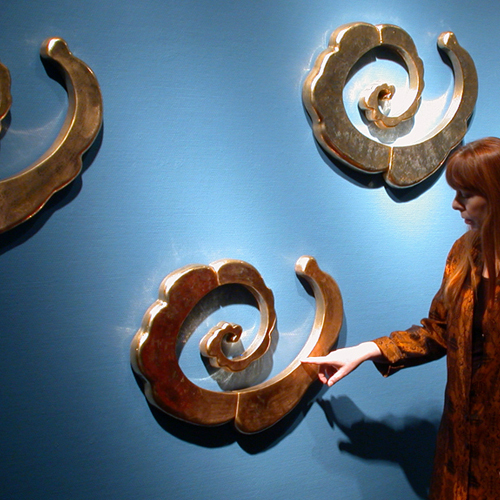 Created in 2007, this piece from the Aurora series, entitled Chinese Clouds (3D Wallpaper), features wall-mounted, 24kt gilt, multifired ceramic units arranged as a rectilinear grouping. Conceived as a drawing in light and shadow, the reflected light effects and the intensification of colour, through a compounding of the reflections in the lustred surfaces, are seen as tools in an ongoing re-examination of both the function and the functionality of sculptural ceramic objects. Collection: The Alberta Foundation for the Arts Art Collection.